A JUDGE has stripped an anti-social tenant of her home for the second time in two months. Christopher Parker QC terminated the reprieve granted to the main occupant of 31, Ash Grove, Bognor Regis, after the house was shut down under new the new Anti-social Behaviour, Crime and Policing Act 2014. On July 23, a recorder judge partially lifted the closure order on the home, allowing just the main tenant access. However, within two days they breached the conditions of the reprieve and have lost the home again. “The effect of terminating the right of occupation is that they are back to square one,” said Judge Parker of the tenant, who cannot be identified for legal reasons. The house was originally shut down in an unprecedented legal move by magistrates on June 5. Both Arun District Council and Sussex Police applied under the new act to board up the house and make it off limits for three months, following complaints from residents. On Monday at Chichester Crown Court, Judge Parker heard evidence from the council saying neighbours heard and saw a man entering the property on the night of July 30 – just two days after the occupant moved back in on July 28. 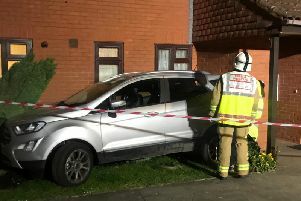 In addition, on the evening of August 3 another man parked his car on the drive and flashed his lights at the home, which was spotted by neighbours. Police arrived at the scene and searched the man’s car, finding cannabis and arresting him. The house is now off limits to everyone until September 4. A magistrates’ court will hear an application to extend the closure order for a further three months on August 28.